It’s remarkable when you think about it. 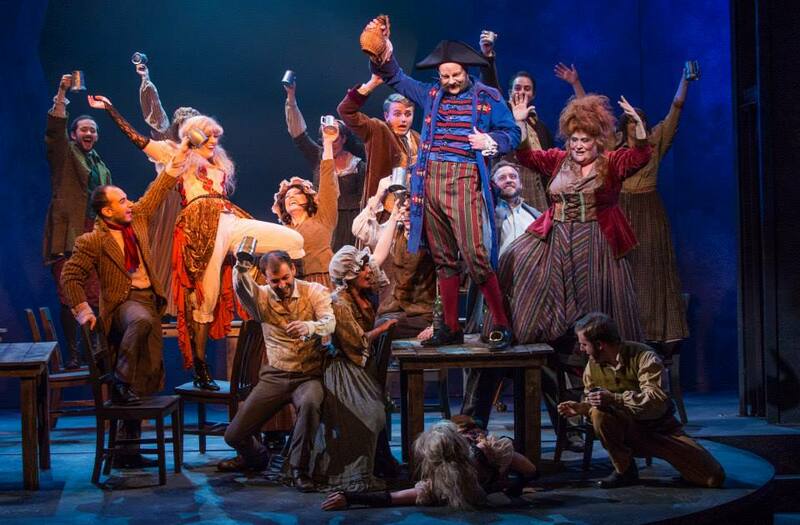 Les Miserables has been with us for thirty years – thirty-five if we consider the original French production – and if the Saturday night opening weekend packed house at Arizona Broadway Theatre in Peoria is anything to go by, all these years later, there’s just no stopping it. It’s a juggernaut. The first thing that hits you as you enter ABT’s theatre with its redesigned stage and a set that appears to be spreading out, reaching way past the proscenium on either side, is just how giant this new production is going to be. Since its initial 1985 London opening, followed by the ‘87 Broadway premiere, each successive national tour of Les Miz has altered things. New back-screen slides were added, and then the slides became moving images. Sets were redesigned. Some tours even made the musical look smaller by either cutbacks in budget or by presenting the whole show as something more intimate. Even the acclaimed 2012 movie diminished the overall look by shooting the film not in widescreen but with a standard screen ratio and plenty of close-ups. In spirit, ABT has gone back to the beginning. Like a Dickens novel with its involved plot, its multitude of characters and its sprawling time-frame, Les Miserables is meant to be big. In fact, it’s meant to be huge. 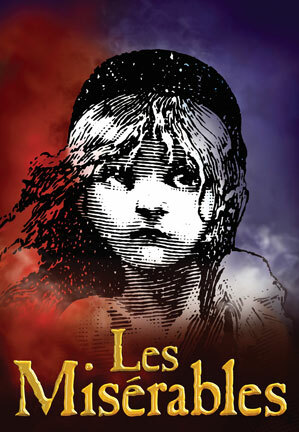 This new Peoria production may not quite appear as it did back in ’85 but with its massive cast of full-bodied voices, Mark 4Man’s powerful sounding orchestra, a dazzling, ever moving light show and an eye-catching set that forever appears to expand, Les Miserables, as presented at Arizona Broadway Theatre, is truly epic. Because of its overwhelming popularity, not to mention audience return visits, most are familiar with the story of Jean Valjean and how after stealing a loaf of bread he serves nineteen years doing hard labor in a French prison. Because of the show’s longevity and the fact that a chunk of the audience has already seen the musical – often several times – the plot and its sprawling events are rarely questioned; everyone knows what’s happening, but for newcomers, hearing that mammoth score for the first time and witnessing the unfolding events that regularly brings on new characters without introduction as if we should already know them, without the help of a synopsis, clarity of plot remains an issue resulting with the occasional disconnect from what’s happening. 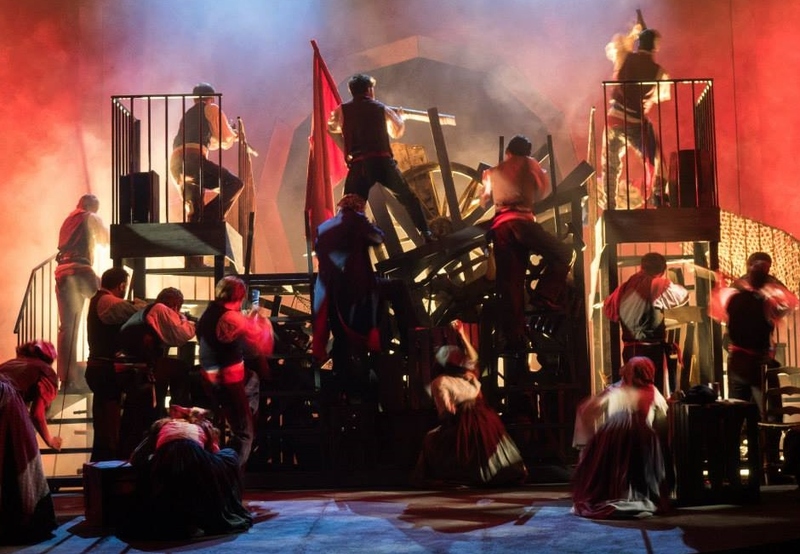 Paul Black’s outstanding, ever assembling set and rock concert lighting design aside, at the end of the day with any production of Les Miz, the show ultimately succeeds or fails with its casting. With a production this large, pinpointing individual performances that standout could take all day. Hannah Bentley’s Fantine effectively elicits our sympathy just as the character should, Patton Chandler’s Empty Chairs at Empty Tables as the student Marius is a musical highlight, and Laurie Elizabeth Gardner’s Cosette makes it easy for us to understand how Marius could fall in love with for her so fast. Brad Rupp and Johanna Carlisle make an impressive, comical team as the thieving, vulgar Thenardiers, particularly Johanna whose Madame Thenardier is much closer in tone to the character’s original presentation than some of the more over-the-top, cartoonish portrayals that have plagued this colorful character in subsequent productions. Mark DiConzo’s Javert is as full-bodied and as powerful as the intimidating character should be, while Kiel Klaphake as Valjean impresses when singing solo but appears less forceful a presence when dueling with Javert. That robust quality required of the character is markedly absent when sharing the stage with others. But let’s give credit where it’s really due. It’s always a thrill to see local, young talent develop with each successive new production, and here the salute needs to go to Carly Nicole Grossman as Eponine. 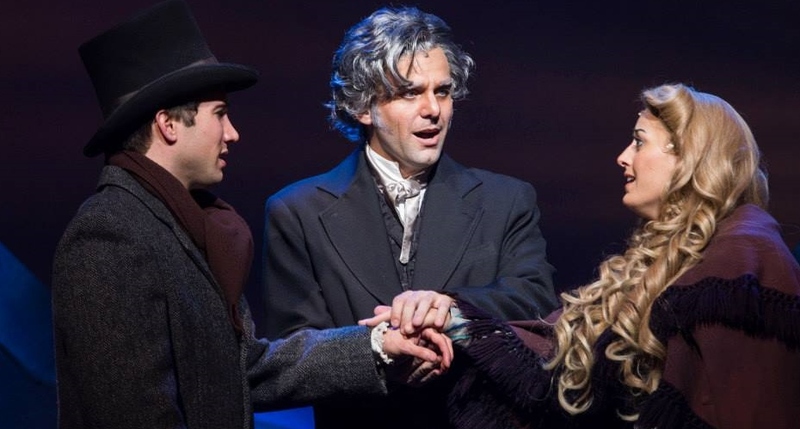 There’s always a thrill when you feel you may be watching something special happening, and here, despite recent professional appearances at both ABT and Phoenix Theatre, it’s with Les Miserables that Carly has truly grabbed her opportunity to shine. As Thenardier’s little girl, Carly pours her heart and soul into On My Own. It really is a show-stopper as illustrated not only by the huge applause but by the roars of audience approval that accompanied the clapping. If there were any Friday night jitters, they were smoothed over by Saturday. Director James Rio keeps the whole production nicely in check with sharp, non-stop scene transitions and adds several directorial flourishes of his own, including the use of an extra bright spotlight that momentarily hangs over each character as he or she dies. It’s a technique that’s particularly effective when Fantine passes away, illustrating a separation of body and spirit, then fading to black as that spirit is finally extinguished. When the show was first produced, playbills included story outlines, but this habit of including a synopsis to help put events into perspective has faded. Perhaps producers take it for granted that after thirty years of continuous performances, everyone by now should know the show. Advice to newcomers: Go on-line and read a plot summary. Once you have an idea of what’s happening and why, plus an understanding of who all those students are and what they’re singing about, you’re appreciation of the unfolding events will increase substantially. Your connect with the show will be complete and your admiration of the spectacular score with those haunting melodies will make it easier for you to understand exactly what all the fuss has been about for the past thirty years. For more regarding times, dates and tickets CLICK HERE for the ABT website.